tring4 has provided exceptional music in the Washington D.C. area since 1989. From the Presidential Inauguration Ball, official State Department Receptions to celebrity weddings and VIP events, we have references on file since 1989! 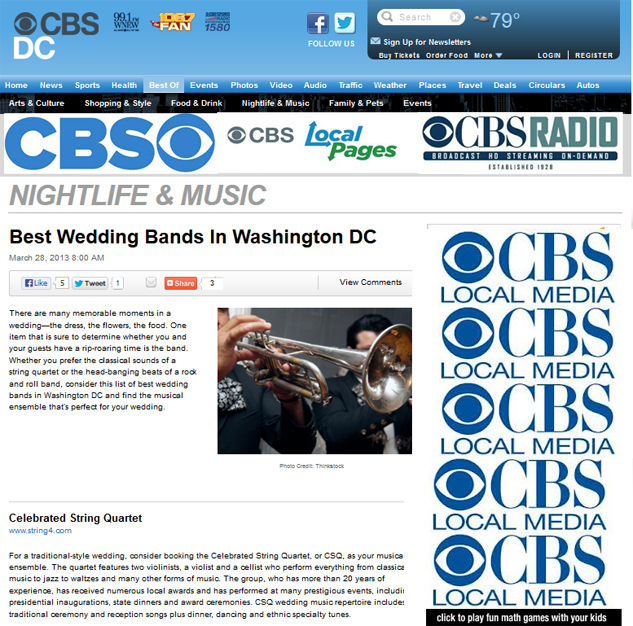 As Washington’s TOP string quartet, we have been voted Washingtonian’s Best for ten consecutive years, selected The Knot Best of Weddings in a nation-wide survey, interviewed numerous times for articles in the Modern Bride and The Washington Post, and even provided music for a commmercial airing on NBC4! We ARE the “go-to-source” for event planners, music coordinators, brides, and by many other happy clients. For a traditional-style wedding, consider booking the Celebrated String Quartet, or CSQ, as your musical ensemble. The quartet features two violinists, a violist and a cellist who perform everything from classical music to jazz to waltzes and many other forms of music. The group, who has more than 20 years of experience, has received numerous local awards and has performed at many prestigious events, including presidential inaugurations, state dinners and award ceremonies. CSQ wedding music repertoire includes traditional ceremony and reception songs plus dinner, dancing and ethnic specialty tunes. Dear Bridgette – Thank you very much for your cooperation on our reception! Secretary Kerry, Ambassador Kennedy and Ambassador Sasae were really delighted with the performance. Your performance helped to enhanced the mood of our reception. We truly appreciate your kind support. I will send the pictures as soon as they’re ready. Again, thank you very much! And please give our compliments to the performers! We thank the quartet so much for the glorious music! Thank you, also, for the organized and timely way in which you handled all of the business details. We’ll certainly think of the CSQ when our younger daughter gets married, whenever that happens to be. Your contribution to Briony and Jason’s wedding at The Inn at Vint Hill was extremely important to us, and you did a wonderful job, living up to your reputation and certainly our expectations. I wish I could have spent more time just listening to you, but there was too much happening! Thank you for helping to make my daughter’s wedding day so perfect! Thank you so much for playing such beautiful music during our wedding cocktail reception and dinner celebration at the Hay-Adams Hotel. You made the day so perfect for us and we appreciated that you were there on our wedding day. Your group was complete class and worthy of our highest praise. Please consider us as your reference should future clients want to know how beautifully you play. I just want to let you and your fellow musicians know how much we all loved your performance at the wedding this past weekend. Our guests from all over the world raved about the music and the musicians. Everything was just perfect during the cocktail hours and the reception–we didn’t have to worry about a thing where the music was concerned. The selections were absolutely superb and everyone–young, old and in-between–had a great time. You all are worth your weight in gold. I am SO happy we happened upon the quartet last year at the Four Seasons and got your card. Nina and Simon’s decision to add the swing orchestra at 9:00pm was brilliant– the reception ended on such a high note we couldn’t get people to leave! Thank you, thank you, thank you for making our daughter and son-in-law’s wedding everything they had hoped it would be and more. How does a person thank you enough for yet another superb performance by the Quartet? When you play, it’s as if the Heavens open and the angels have been sent to touch one’s soul. The music, the angelic singing, bring smiles to our hearts and tears to our eyes. What God given gifts you all have been granted and you share them so beautifully. You have enhanced the memory of our daughter’s wedding that will be enjoyed for generations to come. From our hearts we thank you all. You choices of soloist and trumpeter were impeccable! Thank you, thank you, thank you.